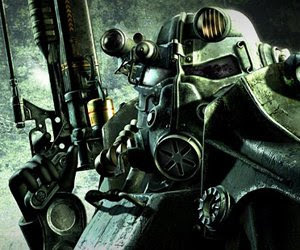 Home » fallout 3 , video games » FALLOUT 3 getting more DLC... and it's coming to PS3 too! FALLOUT 3 getting more DLC... and it's coming to PS3 too! What the boys (and girls) at Bethesda are doing with their nigh-unstoppable hit Fallout 3 is possibly the future of single-player video games as a successful business model: pour a lot of effort into making an outstanding game experience, and then use the initial game as a platform upon which to build and sell more content that is just as outstanding. The Operation Anchorage downloadable content alone is letting Bethesda sleep atop a pile of greenbacks. So I hope y'all have some room on the hard drives of your PC, Xbox 360 and PlayStation 3 (yes, the PS3!) 'cuz Fallout 3 is about to get a bunch more DLC. The big news for PlayStation 3 owners is that the previously produced content is coming to their system at last, beginning with Operation Anchorage later next month. That'll be followed up by The Pitt and Broken Steel. Everyone will also soon be getting Point Lookout (featuring a swamp environment) and Mothership Zeta (marking the return of the "aliens" to the Fallout saga). If downloading new content ain't your thing for whatever reason, Fallout 3 Game Add-on Pack #1 - containing Operation Anchorage and The Pitt - will be available for retail sale next week, and Add-on Pack #2 with Broken Steel and Point Lookout on sale in August. And if you don't own any Fallout 3 yet, a Game of the Year edition with all five add-ons will hit the street in October. I'm really glad that the DLC for Fallout 3 is coming to PS3. I was very upset to find out when first announced, it wasn't coming to PS3, and that all indication was that it wouldn't even come out on PS3. Now I hope the DLC for GTAIV will one day make its way to PS3. That's one thing I hate about multiplatform games is when they release addons that are exclusive to a system, because it means that people would not be getting the same gameplay experience as others. I haven't even finished playing Fallout 3, because of the whole DLC thing. Too bad the game is a load of Dog crap. I actually enjoy the game even if it is pretty much The Elder Scrolls 2277. Which explains why I hate the game.